Olan & Son Mobile Homes is a family-owned business that’s been around since 1964, and provides an expert service for all aspects of mobile home ownership. We are experts in mobile home Sales, providing both new and used models, including all the well-known mobile home brands. Furthermore, we can deliver your mobile home anywhere in the country with our highly experienced and fully qualified drivers. We offer great value and affordability and we will guide you through all aspects of mobile home sales. If you are looking to buy a mobile home in a holiday park, then we may be able to acccomodate you in Gleeson’s Holiday Park (our beautiful holiday park overlooking the picturesque Clogga Bay in Co Wicklow). If you’re planning on building and need temporary accommodation, a luxury mobile home is a great way to live in style and comfort while you complete your build, which can sometimes take longer than planned. Another use for the mobile home in this high rental market is as a home while you are saving to buy or build. 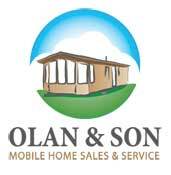 Olan and Son Mobile Homes can talk to you about your requirements. Today’s mobile homes are finished to the highest standards of industry craftsmanship and are built to last. You are very welcome to visit us in Arklow to check out our range of mobile homes, a home that will suit you and your family’s needs. We sell affordable new and used holiday and residential mobile homes. Our mobile homes are spacious, luxurious, highly functional – your cozy and comfortable home away from home. Along with selling affordable new and used mobile homes, we provide a complete delivery service and retrofitting double glazing and central heating to make your mobile home livable all year around. on site for us where we now spend all our holidays. I would highly recommend Olan if you need to get your Mobile Home moved. He moved my mobile for me. at all. Very professional service. Thanks again guys. re-sited it on the new one. He set it up and got it all done (with short notice) just in time for the Easter Holidays. DISCUSS YOUR REQUIREMENTS, GET A FREE QUOTE OR COME VISIT OUR SALES CENTRE!